I recently came across a company called Picture This Clothing and fell in love with them right away. I knew I needed to review their service and products as this is a service that I think every kid and parent will be intrigued by. If you have not heard of Picture This Clothing, then you have to go check them out. 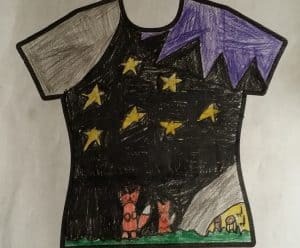 What they provide is a service where your child designs their own t-shirt or dress and Picture This Clothing makes the article of clothing based on your child’s design. I know amazing right! We love, love, love it. First you have to decide if you are designing a t shirt or a dress. Once you have decided what article of clothing you are designing, you then print off the Picture This Clothing template for that item. Template for dresses is here and template for t shirts is here. When you choose your template for your design, you do choose the size of the clothing item you wish to have. For dresses the sizing goes from size 3 to 18 and for t shirts, you choose between the sizes for kids, women, or men. So there is a great sizing variety available. Once you know what you are designing and the right size, you print that template off. Next it is your artist’s turn to get to work and design their clothing right on the template. When they are done, you take a good quality photo of the product and then upload it to the Picture This Clothing website and place your order. 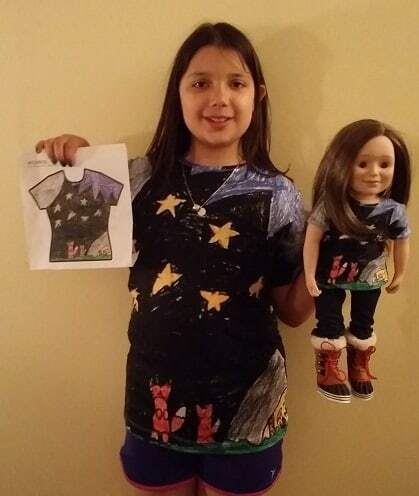 Here is my Little One’s design of her very first Picture This Clothing t shirt…. When your artist does their template, they put their name on the bottom of the design in an area provided. It is not shown in my Little One’s design for her privacy. The great thing is, is that inside the bottom of their product that they design, it will say their name and that the item was designed by them. Now how cool is that! An awesome option available upon ordering is to get a t shirt for your little one’s doll so that the designer and their buddy are matching. I think that this is pretty awesome and so did my Little One. I did not show it in the photo of my Little One’s t shirt, but whatever you design on the front is duplicated on the back of the clothing item as well. The toughest part of the entire process is trying to decide which of the million designs you want to order. I have lost track of the number of templates I have now printed and designs my Little One has created. She is beyond excited about the entire Picture This Clothing concept and was over the moon when she saw her real piece of designed clothing arrive. The clothing from Picture This Clothing is an awesome quality. The t shirt is so soft and fits very well. The t shirt also washed up perfectly with no color fading or dis-figuration. It came out perfectly after washing and drying it. I truly cannot say enough about how much we love Picture This Clothing. I highly recommend that you check them out, but before you go visit them, check out this awesome Summer Giveaway that Picture This Clothing is running…. You have to get your entries in by June 9th so get your little designer drawing…..